Welcome to Quality Physical Therapy's patient resource about Hamstring Injuries. The big group of muscles and tendons in the back of the thigh are commonly called the hamstrings. Injuries in this powerful muscle group are common, especially in athletes. Hamstring injuries happen to all types of athletes, from Olympic sprinters to slow-pitch softball players. Though these injuries can be very painful, they will usually heal on their own. But for an injured hamstring to return to full function, it needs special attention and a specially designed rehabilitation program. Where are the hamstrings, and what do they do? The hamstrings make up the bulk in back of the thigh. They are formed by three muscles and their tendons. The hamstrings connect to the ischial tuberosity, the small bony projection on the bottom of the pelvis, just below the buttocks. (There is one ischial tuberosity on the left and one on the right.) The hamstring muscles run down the back of the thigh. Their tendons cross the knee joint and connect on each side of the shinbone (tibia). The hamstrings function by pulling the leg backward and by propelling the body forward while walking or running. This is called hip extension. The hamstrings also bend the knees, a motion called knee flexion. 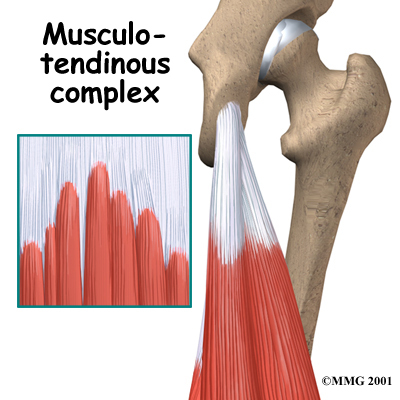 Most hamstring injuries occur in the musculotendinous complex. This is the area where the muscles and tendons join. (Tendons are bands of tissue that connect muscles to bones.) 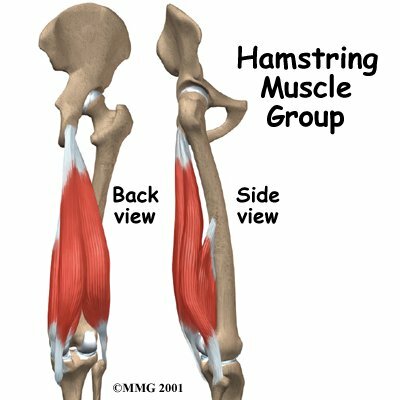 The hamstring has a large musculotendinous complex, which partly explains why hamstring injuries are so common. When the hamstring is injured, the fibers of the muscles or tendon are actually torn. The body responds to the damage by producing enzymes and other body chemicals at the site of the injury. These chemicals produce the symptoms of swelling and pain. In a severe injury, the small blood vessels in the muscle can be torn as well. This results in bleeding into the muscle tissue. Until these small blood vessels can repair themselves, less blood can flow to the area. With this reduced blood flow, the muscles cannot begin to heal. The chemicals that are produced and the blood clotting are your body's way of healing itself. Your body heals the muscle by rebuilding the muscle tissue and by forming scar tissue. Carefully stretching and exercising your injured muscle helps maximize the building of muscle tissue as you heal. In rare cases, an injury can cause the muscle and tendons to tear away from the bone. This happens most often where the hamstring tendons attach to the ischial tuberosity. These tears, called avulsions, sometimes require surgery. How do hamstring injuries occur? Hamstring injuries happen when the muscles are stretched too far. Sprinting and other fast or twisting motions with the legs are the major cause of hamstring injuries. Hamstring injuries most often occur in running, jumping, and kicking sports. Water skiing, dancing, weight lifting, and ice skating also cause frequent hamstring injuries. These sports are also more likely to cause avulsions. The major factors in hamstring injuries are low levels of fitness and poor flexibility. 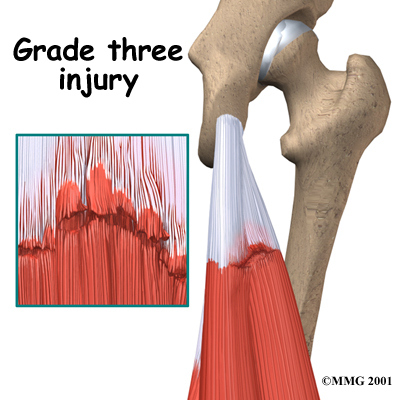 Children very seldom suffer hamstring injuries, probably because they are so flexible. Muscle fatigue and not warming up properly can contribute to hamstring injuries. Imbalances in the strength of different leg muscles can lead to hamstring injuries. The hamstring muscles of one leg may be much stronger than the other leg, or the quadriceps muscles on the front of the thigh may overpower the hamstrings. What does a hamstring injury feel like? Hamstring injuries usually occur during heavy exercise. In especially bad cases, an athlete may suddenly hear a pop and fall to the ground. The athlete may be able to walk with only mild pain even in a severe injury. But taking part in strenuous exercise will be impossible, and the pain will continue. In less severe cases, athletes notice a tight feeling or a pulling in their hamstring that slows them down. This type of hamstring injury often turns into a long-lasting problem. The hamstring may be pulled, partially torn, or completely torn. 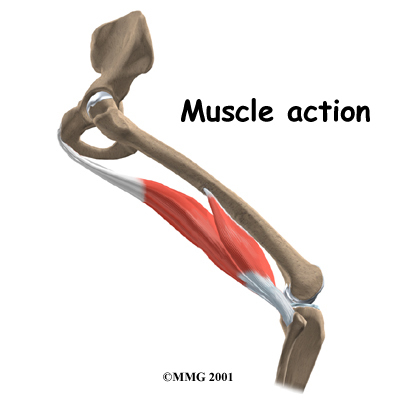 The injury can happen at the musculotendinous junction (mentioned earlier), within the muscle, or where the tendon connects on the ischial tuberosity (avulsion). In the rare case of a complete tear, the pain is excruciating. The torn tissues may form a hard bunch in the back of the thigh when the leg is bent. The skin may also bruise, turning purple from bleeding under the skin. This is not necessarily dangerous but can look somewhat alarming. How do health care providers diagnose the condition? When you visit Quality Physical Therapy, our Physical Therapist will take a detailed medical history that includes questions about your exercise schedule, your activities, and the way you warm up. You will also need to describe your symptoms. Our Physical Therapist will examine the back of your thigh. The physical exam will involve flexing and extending your leg. The probing and the movement may hurt, but it is important to identify exactly where and when you feel pain. Grade one injuries are muscle pulls that do not result in much damage to the structure of the tissues. Grade two injuries are partial tears. Grade three injuries are complete tears. Some patients may be referred to a doctor for further diagnosis. Once your diagnostic examination is complete, the Physical Therapists at Quality Physical Therapy have treatment options that will help speed your recovery, so that you can more quickly return to your active lifestyle. Quality Physical Therapy provides services for Physical Therapy in Burlington. It is very important to treat and rehabilitate your hamstring injury correctly. Incomplete or improper healing makes reinjury much more likely. Although every patient recovers at a different rate, as a general rule, for minor muscle pulls, you may need two to four weeks to safely get back to your activities. For more severe muscle tears, you may need rehabilitation for two to three months, with complete healing possibly taking four to six months. When you begin your Physical Therapy program at Quality Physical Therapy, within the first five days after your injury, the main goal of our treatment is to control the swelling, pain, and hemorrhage (bleeding). Hamstring injuries are initially treated using the RICE method. RICE stands for rest, ice, compression, and elevation. Rest is critical. Our Physical Therapist may recommend a short period (up to one week) of immobilization. Severe tears may require a longer period of rest. This may mean you spend most of your time lying down. You may need to use crutches to get around. If you put too much weight on your hamstring after an injury, more damage may occur and more scar tissue may form. Our Physical Therapist can help you learn how to properly move about on your crutches. We will apply ice to the injured hamstring. This will help to control swelling and pain but doesn't stop it completely. This is important because your body's inflammatory response actually helps your muscles heal. Cold treatments slow the metabolism and blood flow in the area. Cold also reduces your sensations of pain by numbing the nerves. And experiencing less pain helps you relax, reducing muscle spasms. A plastic bag full of ice cubes or crushed ice, held on with an elastic bandage, is the most effective type of cold treatment. The ice should be kept on the injury for 10 to 15 minutes. You can also use cold gel packs, chipped ice, or cold sprays. We recommend that cold treatments should be repeated at least four times a day for the first two to three days. They can be done as often as every two hours if needed. Do not keep the ice on the skin too long or frostbite may occur. Compression can help reduce the bleeding in your muscle to limit swelling and scarring. To apply compression, your Physical Therapist may wrap your hamstring firmly in an elastic bandage. It is unclear exactly how effective compression is in hamstring injuries, but patients often report having less pain with the wrap. Elevation can help reduce swelling. It also keeps your leg immobilized. The key to elevation is to raise and support the injured body part above the level of the heart. In the case of a hamstring injury, this requires lying down and supporting the leg up on pillows. Our Physical Therapist may also recommend a short course of nonsteroidal anti-inflammatory drugs (NSAIDs), such as ibuprofen, to help relieve the swelling and pain. For muscle injuries, pain relief may be the major benefit of NSAIDs. They do not always treat the swelling of muscle injuries very effectively. Health care providers disagree on when to give NSAIDs. Some think you should start using them right after the injury and stop using them after three to five days. Others think you should not use them for two to four days so you don't interrupt your body's natural healing response. The inflammation is an important part of your body's work to heal your injury. It is important that you follow your health care provider’s advice. As your hamstrings begin to heal, it is critical that you follow your Quality Physical Therapy exercise program to regain your strength and mobility. Our specially designed exercises encourage your body to rebuild muscle instead of scar tissue. The exercises also help prevent reinjury. Rehabilitation can be slow, so you will need to be patient and not push yourself too hard or too fast. Early in your rehabilitation, our Physical Therapist may recommend that you do some of your exercises in a swimming pool or on a stationary bike set to low resistance. These exercises allow you to take your hamstrings through a range of motion without having to hold up your weight. When you can walk without a limp and feel very little tenderness, we will have you start a walking program. Eventually you can work up to jogging. Stretching will be a key feature of your Quality Physical Therapy rehabilitation program. Our Physical Therapist will show you how to stretch properly. Plan to continue these stretches even after you heal, because a reinjury of the same hamstring is common. Increasing your flexibility may help you avoid another hamstring injury in the future. It is important that you maintain good flexibility to keep your hamstrings healthy. We may begin your strengthening exercises with isometric exercises. These exercises involve contracting the muscles without moving your leg joints. As your hamstrings get stronger, we will add light weights. It is important that you feel no pain during these exercises. You should maintain your general level of fitness throughout your rehabilitation. Our Physical Therapist can suggest workouts that don't stress your hamstrings. Most hamstring injuries get better with treatment and rehabilitation. Even world-class athletes with severe hamstring injuries are usually able to return to competition. By keeping the hamstrings flexible and giving the body time to heal, you should be able to return to the activities you enjoy. Surgery is rarely needed, and only if there is a complete avulsion or tear. If you do have surgery, you will begin your recovery with a period of rest, which may involve using crutches. Our Physical Therapist can show you how to properly use your crutches to aviod putting too much weight on your healing leg. After surgery our Physical Therapists can start you on a careful and gradual exercise program for your post-surgical rehabilitation. When your recovery is well under way, regular visits to Quality Physical Therapy will end. Although we will continue to be a resource, you will eventually be in charge of doing your exercises as part of an ongoing home program. Surgery is rarely needed for hamstring injuries. 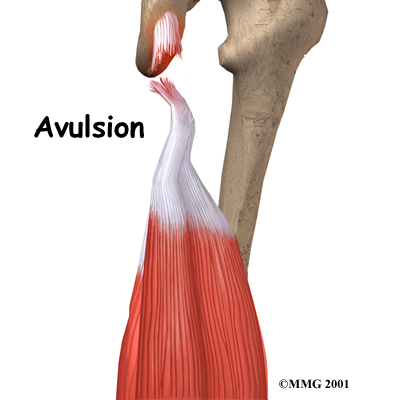 However, it may be needed for an avulsion to reattach the torn hamstring tendon to the pelvis. If surgery is delayed after an avulsion, the tendon may begin to retract further down the leg, and scar tissue may form around the torn end of the tendon. Both of these factors make it more difficult to do the surgery. To begin the operation, an incision is made in the skin over the spot where the hamstring tendon normally attaches to the pelvis. The surgeon locates the torn end of the hamstring tendon. Forceps are inserted into the incision to grasp the free end of the torn hamstring tendon. The surgeon pulls on the forceps to get the end of the hamstring back to its normal attachment. The surgeon cuts away scar tissue from the free end of the hamstring tendon. The original attachment on the pelvis, the ischial tuberosity, is prepared. An instrument called a burr is used to shave off the surface of the tuberosity. Large sutures or staples are used to reattach the end of the hamstring tendon to the pelvis. When the surgeon is satisfied with the repair, the skin incisions are closed. Surgery may be needed to repair a complete tear of a hamstring muscle. An incision is made over the back of the thigh where the hamstring muscle is torn. The muscle repair involves reattaching the two torn ends and sewing them together.